This article will take a look at five non-marketers who are using some pretty remarkable approaches to market themselves and their brands on YouTube. Over the course of a few short years, Michelle Phan has gone from amateur beauty blogger to YouTube sensation. 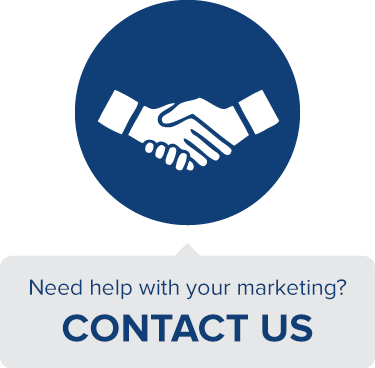 Although much of her success owes to her high-quality content and expertise, there is also a fair amount of web savvy and marketing instinct that has helped her propel her content to great heights. 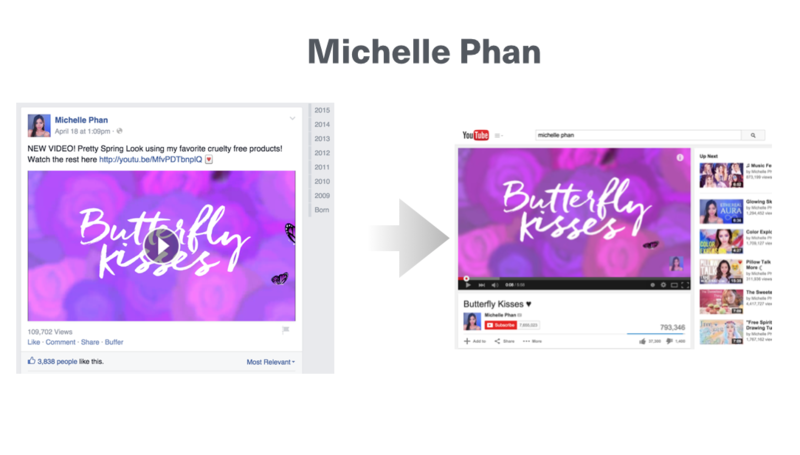 One such instance of Michelle’s inventiveness is how she leverages her sizable Facebook presence and Facebook’s new video platform (which I’ve already shown is favored on the platform) to promote her core YouTube content. Whenever Michelle releases a new video to her channel, she won’t just announce it to her fans via a post or even dropping a link to the YouTube video on her page. She understands that people on Facebook are not looking to watch full length videos and but they are also less likely to respond to text than they are to images or video. Michelle will therefore create a small 15-second trailer to promote her video and upload it to Facebook video (for an in-depth analysis of this tactic, check out my article on Facebook Video). Using this method means that it will auto-play in Facebook’s newsfeed and will be of the ideal length for the Facebook audience. As if to cap off this cross promotion, every single one of her videos includes a call out to follow her on Facebook in the description. What Michelle understands intuitively is that although her core content is centered around YouTube, that might not necessarily be where her audience is. Furthermore, she understands that in order to reach her audience elsewhere, she has to tailor her messaging to the platform where her potential audience is. In this case, this means creating Facebook video micro-content to nudge her audience towards her core YouTube content. Back in early 2007, John Mitzewich was a no-name chef teaching in culinary school. In his spare time he started a blog called Food Wishes and would also upload cooking videos to accompany the recipes he began posting on the blog. Fast forward to today and “Chef John” (as his fans affectionately refer to him) has more subscribers than many of the world’s top celebrity chefs (over 1 million!). Besides his unwavering consistency and oddball humor, one key factor to Chef John’s success has been the synergies that exist between his blog and his videos. Because the two complement each other so well, the audiences that each attracts tend to cross-pollinate very well. Each piece of content has merit enough on its own to be interesting, but the full effect is only felt if you consume both. Therefore if you discover one, chances are high that you will consume the other. 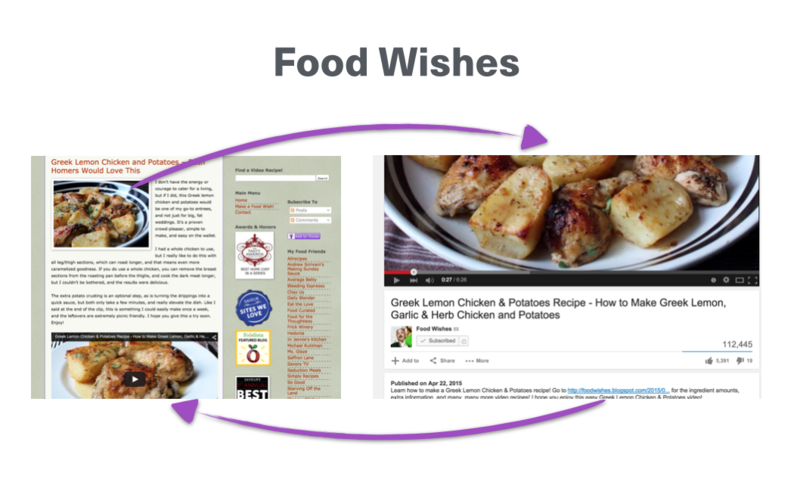 A great lesson from Food Wishes is that in order to truly have a cohesive content strategy your content needs to be inter-related. While it appears that Chef John stumbled upon his system by accident/necessity, the synergies he created between his long-form blog and YouTube content are very real and can be a guide for any brand aiming to pursue a similar content mix. Whereas most traditional media companies have been very slow and clumsy to respond to online-video trends, the non-profit PBS has carved out quite an impressive audience on YouTube through a variety of interesting and unique offerings. One such content series is PBS Idea Channel, where series host Mike Rugnetta provides thought-provoking analysis of modern-day trends using ideas from philosophy and critical theory. His analyses are often on topics that people feel strongly about and he frequently poses more questions than answers; as such, the comments section tends to be filled with heated debates and (surprisingly) constructive discussions. Instead of just letting this audience participation go on in the background, PBS and the Idea Channel team actively encourage debates by offering open questions and dedicating the last third of each episode to discussing and addressing the top comments on the previous episode. Suddenly, instead of commenters feeling like they are wasting their time voicing their opinions that will go unheard, they have this behavior encouraged by the possibility that their comment can be featured and addressed towards all the other Idea Channel fans. Building this kind of feedback mechanism not only fosters constructive discussions and furthers the message of the program, it also encourages first-time viewers to continue exploring the rest of the channel because whatever episode they start with has an entire segment that lacks context without watching the previous episode. Idea Channel can teach YouTube marketers a lot about how to tame and leverage one of the most difficult parts of YouTube – the comments section. 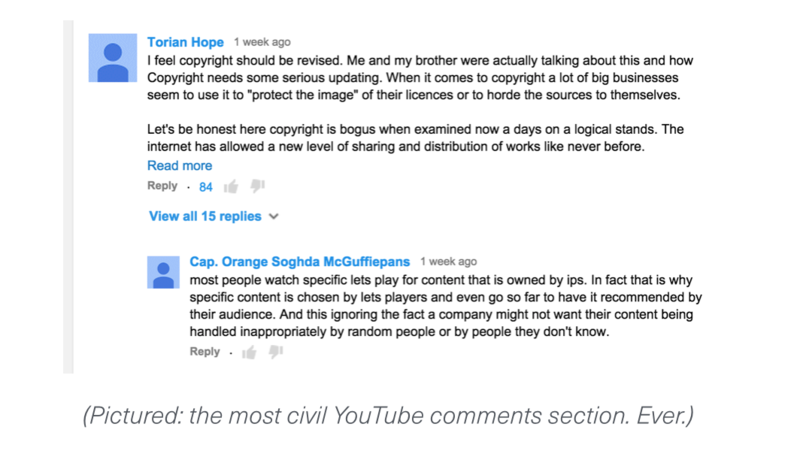 Normally the comments are a necessary evil, and some creators will even turn them off. However, Idea Channel specifically tailored their content to feature the comments and in so doing redirected the typically negative energies of commenters into constructive elements that not only enhance the channel’s content, but that provide a value all their own. 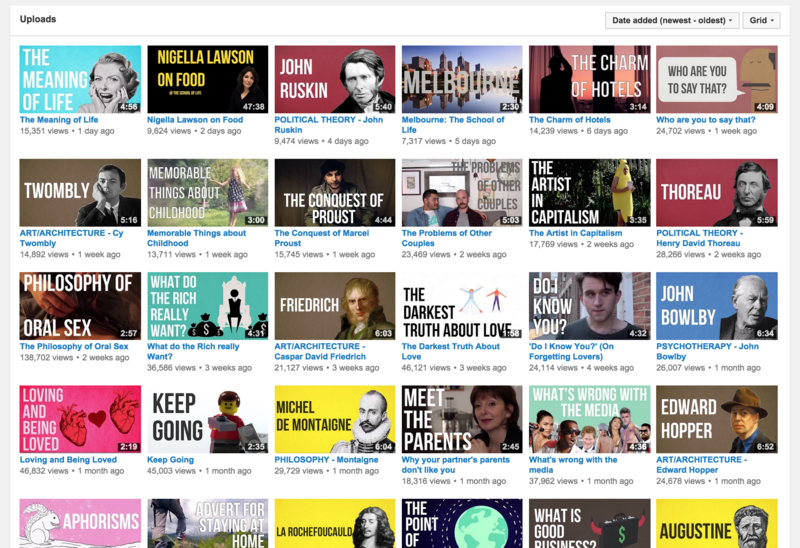 The School of Life is a YouTube channel with a scope about as broad as its title implies. Over the course of only seven months they have put out a staggering 110 videos discussing everything from the ideas of Plato to an analysis of what babies can teach us about love. Such a wide and seemingly unrelated variety of topics could quickly cause a regular audience to get confused about what to expect and what exactly the channel was all about. However, The School of Life implements a strong and coherent visual and stylistic language that ties all of their disparate pieces of content together into one unified whole. One gets a sense of just how effective this strategy is by looking at their video list in grid form. The School of Life channel turns out to be a content marketing effort for a fairly expensive lecture series given throughout Europe. Presumably they hope the channel will showcase some of the depth and breadth of topics given in these classes. The channel achieves this goal beautifully by uniting all of the various elements and ideas using consistent style and design. Clearly The School of Life has more to teach than just philosophy. 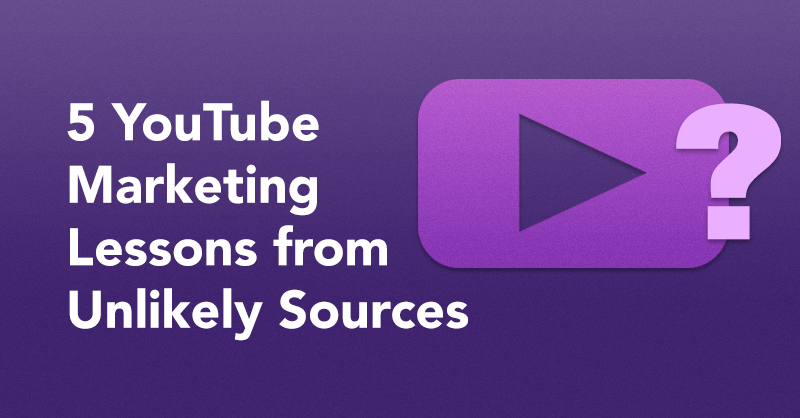 The School of Life’s lesson for marketers is that you can use your YouTube content to touch on a wide variety of topics, but that in order to do so and still keep your branded messaging coherent you have to tie certain elements together. In the case of their channel, School of Life intuitively understood that if each video looked and felt similar, then they could discuss a very wide variety of topics and still not worry about diluting their brand or confusing their audience. The Glove and Boots channel is somewhat hard to pin down. It features puppets yet discusses pretty heady topics most of the time. Think of it almost like a grown-up Sesame Street. As strange as the channel sounds, the combination actually works. Their videos are supremely entertaining and universally well-received (they won the Shorty Award for Best Videoblogger in 2012). A key reason the channel’s content shines is because they make pretty intellectual and/or uncomfortable subject matters entertaining and accessible by being incredibly self aware and using incisive humor and wit. Take one of my favorite videos from the channel as a key example. In this six minute video Glove and Boots explains a complicated idea from a literary critic using Adam Sandler’s Happy Gilmore as their centerpiece example. Not only is the video entertaining and fun to watch, these very attributes make the otherwise dry subject matter come to life and stick in your memory. Especially for marketers who might be communicating a less than thrilling idea or product as part of their online video marketing strategy, it might pay to take a page from Glove and Boots and inject some humor or at least wit into your content. Any subject matter can be entertaining and enjoyable if you frame it in the right way, and imbuing your ideas with humor can be a very effective way to make them noteworthy and catchy. The lesson to learn from Glove and Boots is that even the most unlikely and unremarkable topics can be made memorable and sticky by utilizing humor and wit in your explanation. No matter the seriousness of the subject matter or clientele, injecting a little levity or cleverness will always be welcome and will likely make for more effective and enjoyable content.